According to The Taulbee study, only 17.9% of undergraduate computer science degrees were awarded to women in 2016 – but the blockage in that pipeline doesn’t start in college. In high schools, 27% of AP CS exams were taken by women; and before that, girls drop out of STEM subjects in their teens, discouraged by a lack of role models and a plethora of gender stereotypes. Yet the enrollment of women in coding bootcamps has gradually increased since the first coding bootcamps launched in 2011. 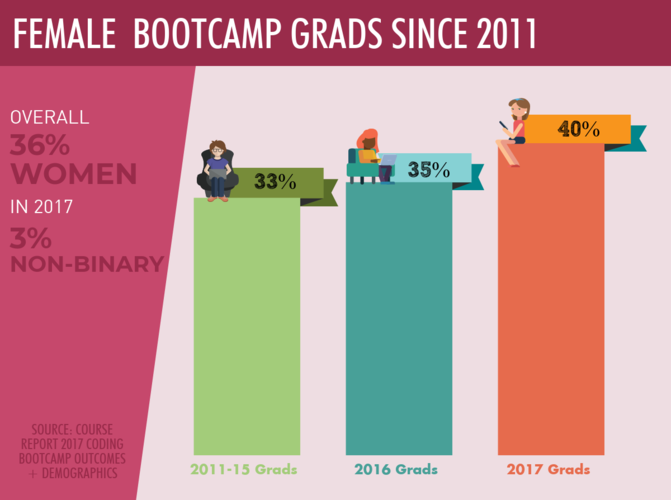 In the Course Report survey, we found that 40% of bootcampers who graduated in 2017 were women. Over time, that representation has only grown (women accounted for 33% of graduates before 2015). 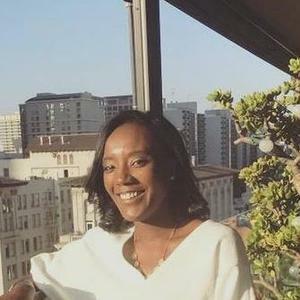 Sarah Ervin, Ada Developers Academy Student Counselor and Diversity Trainer, sees that the advent of the personal computer amplified that shift. “Boys and young men were more likely to be directed towards computer technology and we developed the masculine ethos around tech that we’re still grappling with today,” she says. Online coding bootcamps like Thinkful and Bloc bring geographic freedom and accessibility to the bootcamp model. Unlike traditional MOOCs, however, online coding bootcamps offer face-to-face instruction, guided mentorship, and an outcomes-based curriculum. 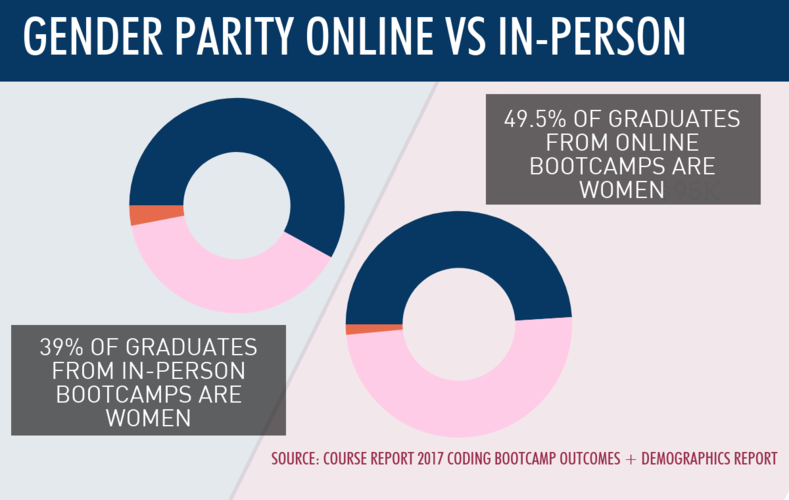 In online bootcamps, women (49.5% of online graduates) and men (49% of online graduates) are almost equally represented. For women specifically, flexible learning models enable more access for mothers and caregivers to be able to learn at their own pace or without leaving their homes. For example, Flatiron School currently sees 50/50 gender parity in their online program. The bootcamp attributes this success to their Women Take Tech Scholarship which quickly reshaped their online community from 35% women to 50% women. And on top of the pay gap between men and women, “there's a confidence gap,” says Flatiron School’s COO, Kristi Riordan. “We look for ways to break down imposter syndrome for women in our community, before, during, and after our programs – from trusted routines in which students can speak openly about their experiences to panels and events that inspire and spark conversation about these issues.” For Flatiron School, every interaction with their team plays a role in showing women that this kind of education and career isn’t out of reach. Not only do we see a current education skills gap for women in tech, but there’s also a real challenge with salary and compensation for the women who have broken into the industry. 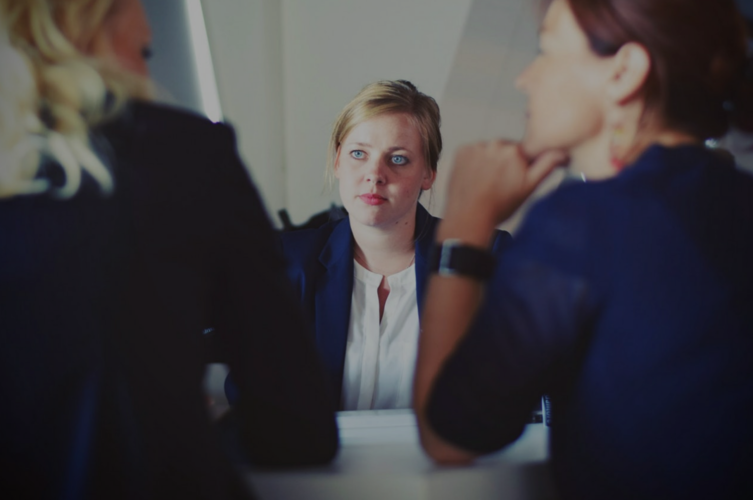 While women see salary disparities at every step of the journey, Comparably’s latest study shows that women new to the tech workforce (18-25 years old) make 29% less than men in the same age group. According to the latest outcomes study, coding bootcamp grads don’t escape this disparity; while women saw more drastic salary growth after graduating from a bootcamp, men still report a higher average salary. We know that this debate is not merely ethical, it is also economical. The importance of diversity of thought and life experiences speaks volumes to the bottom line of a business, and to the overall success of the economy. Morgan Stanley reported that a more diverse workplace delivers better returns and less volatility. Mckinsey reported that companies in the top quartile for gender diversity are 15% more likely to outperform against industry medians. With the creation of all-women learning environments, students can learn in a safe place and graduate as a confident tech professional. All women spaces are more supportive and conducive to taking on challenges that male peers may not relate to. Tori Tsu, Marketing Manager at all women school Hackbright Academy says, “being the only woman in a classroom of men can worsen the effect of Imposter Syndrome, a condition to which many software engineers, regardless of gender, are especially vulnerable. While students will likely join teams of mostly men after graduation, Hackbright peers are available as a supportive network of women on similarly male-dominated teams.” Hackbright prides itself on a robust mentorship program, as well as a powerful alumnae network to help support students while in the program, and after graduation. Bootcamps recognize the inherent problem of the current state of the tech industry, and with part-time options, flexible scheduling, mentorship, and scholarships initiatives, they continue to help provide a solution. Achieving gender parity in the technology industry will not be an easy task, but by diversifying the education paths that feed the pipeline, we’ll start to see improvement.